Only this wasn’t the traditional sort of storm, with the thrashing wind and the waves crashing over the deck. Rather, it was a sudden deluge of rain that sent the breeze into a game of hide and seek during the crucial first leg. So far it’s been that sort of an event for the 29 sailors competing in the Finn. Light air limited the Finn sailors to just two races over the first two days. Today was better, but with the rain cells rolling through the second of three races, the regatta has been a test of mental fortitude more than physical strength. “I’m super happy to have survived the light tricky races and to be going good in the breeze,” said Salminen. Charline Picon (FRA) is the defending Olympic champion in the Women’s RS:X. 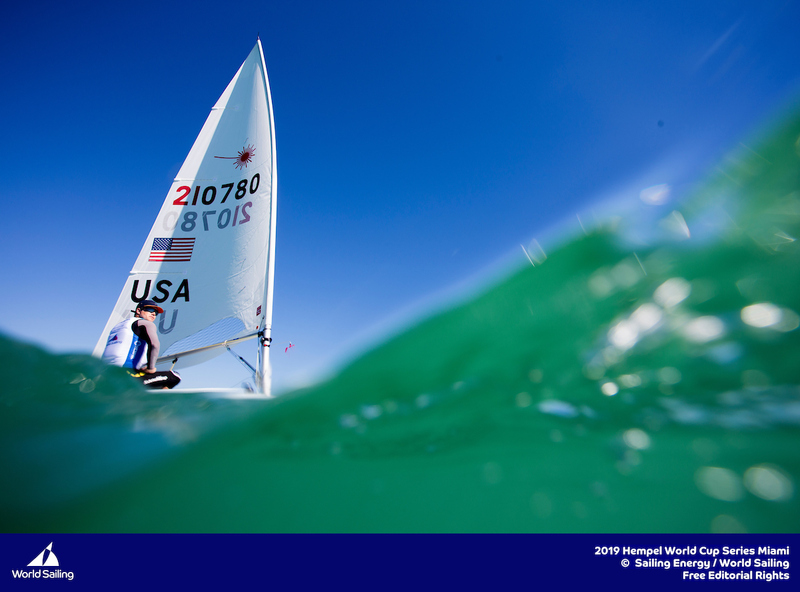 But she came into the Hempel World Series Cup Miami with some doubt about her current standing in the fleet. She is still building back her form after having a daughter less than two years ago. Picon’s day didn’t start well at all. She felt a little under the weather leaving the dock and then she and the rest of the fleet had to wait out the rainstorm on the water. Once the rain passed, the wind filled in at 8 to 12 knots, right in her sweet spot. But the first race didn’t go as planned. The strong finish to the day put Picon into second place in the overall standings, after five races, two points behind Zofia Noceti-Kelpacka (POL) and four points in front of Katy Spychakov (ISR) in third. While Picon is gauging herself against the fleet as a whole, she’s also keeping a close eye on other French sailors. Last year, in Picon’s absence, Hélène Noesmoen (FRA) won this regatta. And Lucie Belbeoch (FRA) has shown potential as well. Four races today have the 49er class nearly back on schedule. In no fleet has consistency been more elusive. With a pair of race wins to close out the day—after a 17th and an eighth to start it—Rio 2016 bronze medalists Erik Heil and Thomas Ploessel (GER) are now winning by just over six points. The pair was granted average points for their first race, which accounts for the fractional score. Dylan Fletcher-Scott and Stuart Bithell (GBR) are second with Sime Fantela and Mihovil Fantela (CRO) in third. While there’s a significant point spread between first and seventh, the gap between seventh and 14th is much tighter, which will set up a particularly fierce battle tomorrow as everyone aims for a place in the top 10 and a chance to compete in Saturday’s Medal Race. A pair of Polish sailors have taken command of the Men’s RS:X class. Radoslaw Furmanski (POL) was the top sailor of the day with a fifth, a first, and a second, lifting him 10 points clear of countryman Pawel Tarnowski (POL). Matteo Sanz Lanz (SUI) is third, currently on the wrong side of a tiebreaker with Tarnowski. Fresher breezes meant lots of foiling for the Nacra 17 fleet, which ripped through four races today and is on track to complete its scheduled 12 before Saturday’s Medal Race. The increased breeze also restored some normalcy to the standings after a lot of inconsistency over the first five races. The top two boats have started to edge away from the fleet. Samuel Albrecht and Gabriela Nicolino de Sá (BRA) maintain the overall lead, but have just four points over Jason Waterhouse and Lisa Darmanin (AUS). Third place, John Gimson and Anna Burnet (GBR), is 16 points further back. The Men’s and Women’s 470 were unable to race on Wednesday but two good races today has seen their leaderboards take shape. Agnieszka Skrzypulec and Jolanta Ogar (POL) won both races on Tuesday and today they did enough to hold on to their lead. They posted a fifth and a 22nd, which they discard. They are on seven points, three clear of Hannah Mills and Eilidh McIntyre (GBR) who won the final race of the day. China’s Mengxi Wei and Yani Xu took the first win of the day and are down in 14th. American favourites Stu McNay and Dave Hughes moved up to first overall in the Men’s 470, level on points with overnight leaders Anton Dahlberg and Fredrik Bergström (SWE). The day’s race wins went to the fifth-placed Chinese team of Zangjun Xu and Chao Wang as well as Martin Wrigley and James Taylor (GBR) who are in 15th. Three races were held but scoring for race seven was under review at 18:00 local time. But after race five and six, Norway’s Hermann Tomasgaard was the best performer, continuing his qualification series form in the gold fleet. He finished fifth in the first race of the day and followed it up with a second. He has a provisional score of fifth in the third race. Tomasgaard’s fifth was his worst result so far and as a result, he discards it. Many of his rivals around him count high scores so the odds are stacked firmly in the young Norwegians favor at this point. Consistency is also hard to come by in the 59-boat Laser Radial fleet and the initiative is swinging back and forth. Alison Young (GBR) advanced to first overall following a discarded 14th and a seventh. Paige Railey (USA) is second overall, two points off Young, following a win in the final race of the day. Donshuang Zhang (CHN) is third. Racing resumes once again at the earlier time of 10 am. The 49er, 49erFX, Nacra and RS:X fleets will sail their final day of qualification ahead of Saturday’s Medal Races. The Laser fleet, the largest of the regatta with over 100 entries, sailed two races today to finish its qualifying series. Tomorrow, the fleet will split into Gold and Silver Fleet racing. Two U.S. sailors are well positioned for a run at Sunday’s Medal Race having each scored all top-10 finishes in the qualifying races. Chris Barnard (Newport Beach, Calif.) is seventh and Charlie Buckingham (Newport Beach, Calif.) is 12th. But just five points separate fifth from 15th in the always-competitive class. With 18 months until the Tokyo 2020 Olympics, Barnard is focused on the big picture. But there’s some pretty attractive carrots dangling at the end of this six-day competition. In the Laser Radial class, Erika Reineke (Fort Lauderdale, Fla.) made the most of today’s single race. A fifth place moved her up to 11th place overall, just three points behind Paige Railey (Clearwater, Fla.). That class will get an early start tomorrow as they look to make up for lost races over the first two days. The Nacra 17 class squeezed in two races toward the end of the day and there is now just four points between the top three American teams. Sarah Newberry and David Leibenberg (Livermore, Calif.) lead the way in 11th place with 40 points. One place, and three points behind, are 2016 Olympians Bora Gulari (Detroit, Mich.) and Louisa Chafee (Warwick, R.I.) with Ravi Parent (Sarasota, Fla.) and Caroline Atwood a point further back. A 13th in the lone Finn race today, combined with a third yesterday, has Luke Muller (Fort Pierce, Fla.) sitting in seventh. Caleb Paine (San Diego, Calif.), bronze medalist in the class from Rio 2016, is 16th. Pedro Pascual is the top American in the Men’s RS:X class in 41st. Farrah Hall, who represented the United States at the 2012 London Olympics, leads the U.S. contingent in the Women’s RS:X class. She is 26th. With just two races per class, there is the potential for a lot more racing for the windsurfers over the next two days. The Men’s and Women’s 470 fleet were unable to get in a race today due to the challenging conditions. Racing continues on Thursday 31 January at 10 am local time with another packed schedule in a bid to catch up on races lost. “The regatta really starts tomorrow with everyone in Gold Fleet,” said Chris Barnard (USA), who is currently seventh. Chinese racers have always been known to excel in light wind and Mengfan Gao (CHN) was the personification of this statement out on the race track. In a variable 5- to 8-knot breeze, Gao grabbed the lead on the first upwind and never relinquished it, finishing more than 20 seconds ahead of Poland’s Maciej Kluszczyski. The race win propels Gao up to first overall, one point ahead of Thomas Goyard (FRA) after three races. The 27-boat Finn fleet were only able to sail one race in 6 to 8 knots of breeze. The phrase, “snakes and ladders,” could not be more appropriate for the fleet as sailors shuffled throughout the race. As the saying goes, you can’t win the event on the opening day but you can lose it, and many of the pre-event favourites but in steady performances that will hold them in good stead as the week progresses. 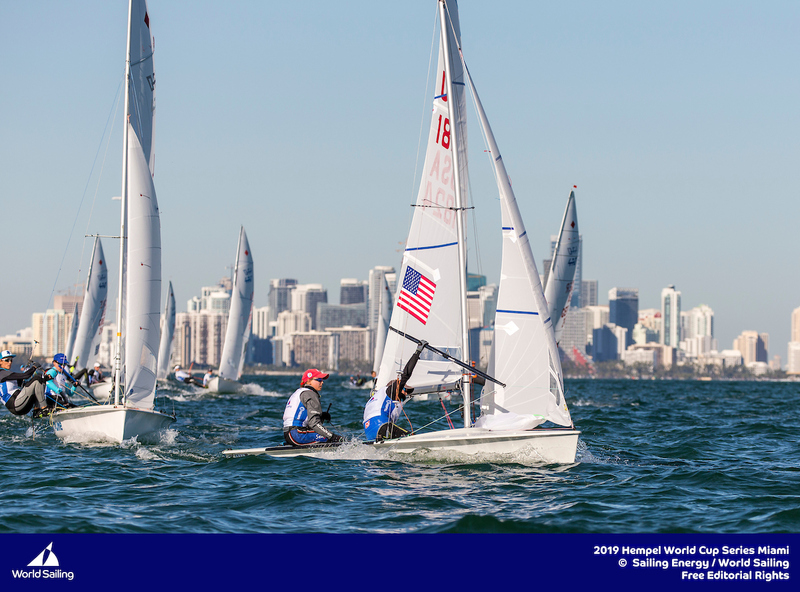 COCONUT GROVE, Fla. (January 29, 2019) — Today’s forecast for Day 1 of the 2019 Hempel World Cup Series Miami was for a light breeze that would eventually settle into a southwesterly direction. The term, settle, however, is relative. When the wind flows from the mainland onto Biscayne Bay, it’s not known for being reliable. The capricious breeze made for a stressful opening day of the regatta, with over 650 athletes from 60 countries in 10 classes all looking to start this event—a key milestone on the road to the Tokyo 2020 Olympic regatta—on the right foot. Regattas can’t be won on the opening day, but they can sure be lost. Fortunately for McNay and Hughes, they avoided any major pitfalls on the water and stand in third place, of 37 boats, after two races. 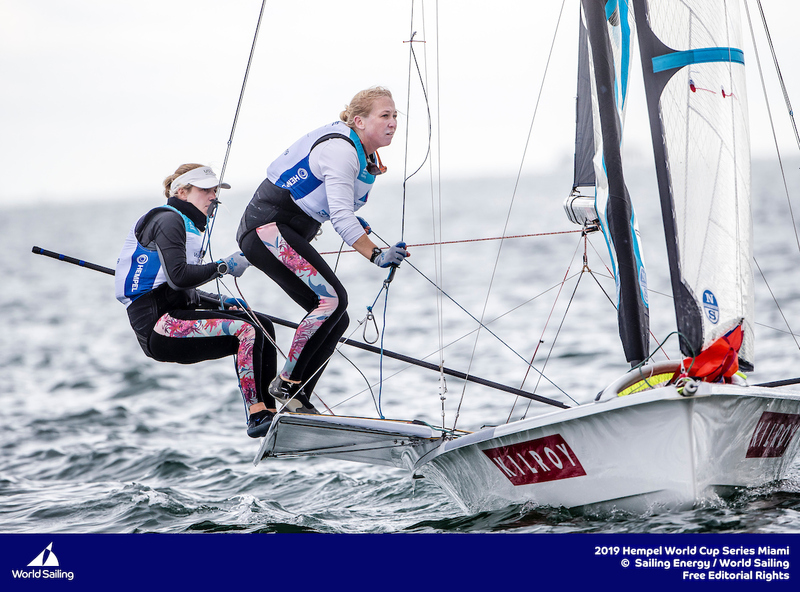 With a seventh at last summer’s Hempel Sailing World Championships in Aarhus, Denmark, McNay and Hughes qualified for the United States for the berth in the Men’s 470 class at the Tokyo 2020 regatta. Now they are focused on making sure they are the team to claim that berth. They’ve been down this road before, but that doesn’t make it easy. The second-placed American team is Lucas Calabrese and Jack Parkin in 11th. Calabrese won a bronze medal for Argentina in the London 2012 Olympics—he’s now sailing for the United States—while Parkin is a former youth world champion. The team is new, but could pose a threat for the U.S. berth in the class. In the Laser class, both Chris Barnard (Newport Beach, Calif.) and Rio 2016 Olympian Charlie Buckingham (Newport Beach, Calif.) had a strong start to the regatta and sit in amongst a knot of five sailors with 13 or 14 points. 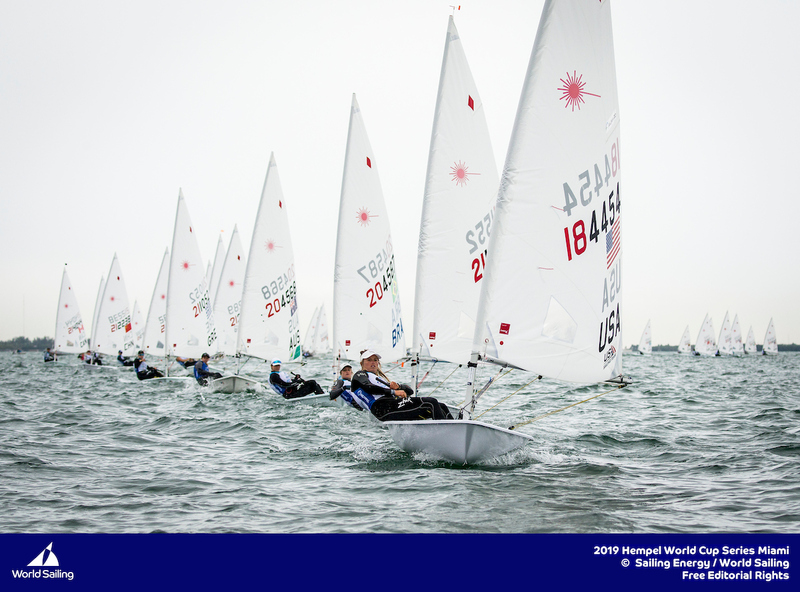 With 101 boats in the fleet, the Lasers are sailing a qualifying series for the first two days before splitting into Gold and Silver fleets for the remainder of the regatta. Two-time Olympian Paige Railey (Clearwater, Fla.) finished 10th in the single Laser Radial race. Charlotte Rose was 16th with Erika Reineke (Fort Lauderdale, Fla.) in 25th. Luke Muller (Fort Pierce, Fla.) made the most of today’s lone race in the Finn class. He finished third while Rio 2016 bronze medalist Caleb Paine (San Diego, Calif.) struggled with a 23rd. Youth World Champions Emma and Carmen Cowles (Larchmont, N.Y.) showed little fear of the grand stage, putting together two top-10 finishes in the 28-boat Women’s 470 class. That places them in fifth, with another pair of sisters, Atlantic and Nora Brugman, the next highest American team in 12th. 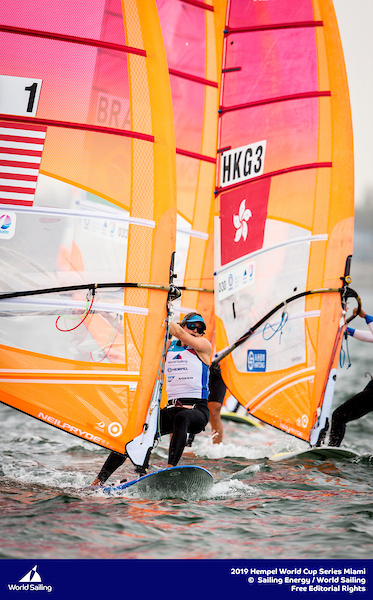 Stephanie Roble (East Troy, Wis.) and Margaret Shea (Wilmette, Ill.) finished eighth in the lone 49erFX race. Paris Henken (Coronado, Calif.) and 2008 Olympic gold medalist Anna Tobias finished 24th. The Nacra 17 class features seven American teams looking at the lone U.S. Olympic berth. Sarah Newberry and David Liebenberg (Livermore, Calif.) have the inside track in this regatta after a solid trio of top-12 finishes. They sit in ninth place overall. Ravi Parent (Sarasota, Fla.) and Caroline Atwood and 2016 Olympians Bora Gulari (Detroit, Mich.) and Louisa Chafee (Warwick, R.I.) are close behind in 13th and 14th, respectively. The 49er class also finished three races today. Nevin Snow and Mac Agnese rebounded from a tough start—a 40th in Race 1—to score two top-10 finishes and are the top American team in sixth with Harry Melges IV (Fontana, Wis.) and Finn Rowe (Lake Forest, Ill.) in 17th. In the RS:X divisions, 2016 Olympian Pedro Pascual is 36th in the men’s division while Dominique Stater is 26th in the women’s. Racing starts tomorrow at 10:30 am on Biscayne Bay and will run through the Medal Races in all 10 classes on Saturday and Sunday, with a live broadcast available on World Sailing’s YouTube and Facebook channels and also on a Jumbotron in Regatta Park in Coconut Grove during the Hempel World Cup Series Miami Festival. A morning northwest land breeze will turn to a light gradient wind from the west as the day progresses. The wind will turn at around noon, when most of the fleets will be out on the water racing, so postponements may be expected. From 10:00 to 12:00 local time 6 to 10 knots are forecast before it decreases to 4 knots at 12:00, when the when veers. Although Miami has clear blue skies, the temperature is quite cool and not warm enough for a thermal sea breeze to develop. Once the wind has veered, a breeze in the region of 5-10 knots is forecast and is not predicted to go beyond this speed. It is quite a change in conditions from the glamorous days the sailors have had in the build-up to the event, but sailors are prepared to expect the unexpected and will be raring to go in any conditions. Results will be available when racing starts on Tuesday 29 January – http://sailing.org/worldcup/results/index.php. 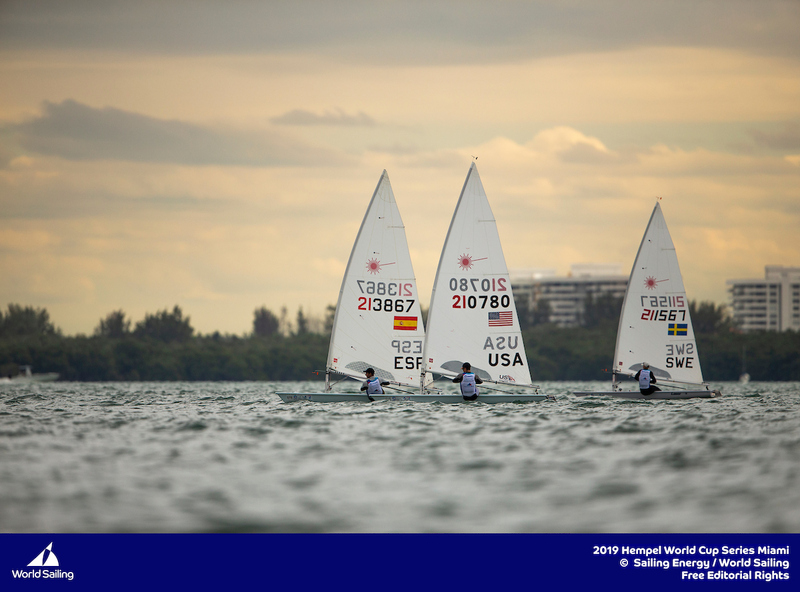 The 2019 World Cup Series Miami, held out of Coconut Grove from 29 to 3 February, will see nine 2018 champions return to Biscayne Bay determined to defend their titles. Waterhouse and Darmanin overthrew Ruggero Tita and Caterina Banti (ITA) in the Medal Race to claim a hard-earned title – but exactly one year ago, the competition was slightly less stressful for the Aussies. Racing on the Biscayne Bay waters in 2018, Waterhouse and Darmanin controlled the fleet all week long and simply needed to finish the Medal Race to secure gold. They did that with ease and are back to defend their title. In 2018, Louis Giard and Helene Noesmoen (right) made it a double French gold in the Men’s and Women’s RS:X windsurfer. Joining Noesmoen in the 44 strong Women’s RS:X fleet will be her compatriot and Rio 2016 Olympic gold medallist Charline Picon, who has been competing again for less than a year after becoming a mother post Rio 2016. Although Picon spent considerable time away from the RS:X, it was almost as if she never left as she finished second at the Hempel Sailing World Championships and seventh on Olympic waters at the Enoshima round of the Hempel World Cup Series. Enoshima World Cup gold medallist Peina Chen will be amongst the Women’s RS:X fleet, as will 2018 World Champion Lilian de Geus (NED) and Olympic medallists Zofia Noceti Klepacka (POL) and Bryony Shaw (GBR). Elsewhere, Rio 2016 gold medallists and 2013 and 2017 World Cup Miami winners Martine Grael and Kahena Kunze (BRA) are fully back into the Tokyo 2020 campaign trail. The pair stepped away from the 49erFX after Rio as Grael focused on a Volvo Ocean Race campaign, but they’re 100% focused on the next Olympic Games. 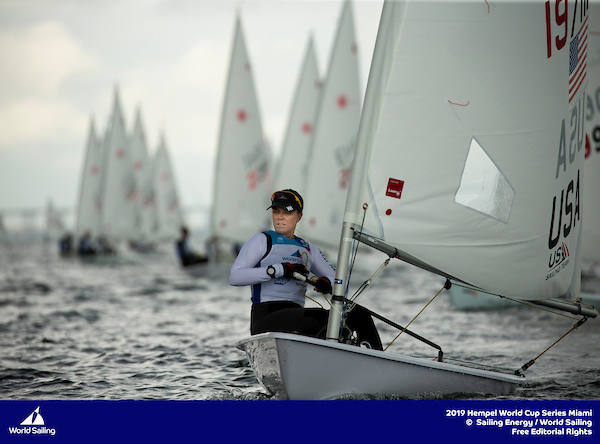 They showcased their skillset at the opening round of the 2019 Hempel World Cup Series in Enoshima, Japan, claiming gold, and recently won the Miami Skiff Mid-Winter Regatta, so they will be firm favourites this week.